Go to ‘File’ > New. The next step is to decide on the dimensions of the canvas you’d like to work with. For portrait work, it’s a good idea to work with a size roughly associated with the standard paper size. For this image in particular, around 9 inches by 12 inches would suffice. 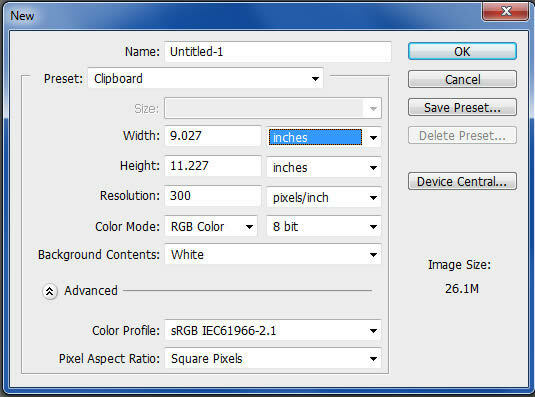 Always remember to use 300 DPI to ensure that the image is suitable for printing purposes. Working at high resolution also helps for detailing and refining as well, so get used to working this way if you haven’t done so! We now have our canvas! Quickly fill in the background color with a light gray to ensure your eyes won’t be bothered (pure white has a tendency to do that). Use the Gradient tool (G) to fill in the canvas. This is where we handle the line work. We’ll handle this step in two layers; The first layer will be the preliminary work, where we focus on the basic look of the image and focus on the major shapes, gesture, and form of the character. The second layer, which we’ll name ‘sketch’, will be where we take our time and go over our existing line work to ensure a cleaner appearance. Using a hard-edged brush with a fairly low opacity, I quickly sketch out the character, while looking at a variety of different photos for reference. In this case, I had my brother pose for the general pose and lighting (I wanted the light to come from the bottom to give the image a dynamic appearance). I also looked up some references from the movie ‘The Dark Knight’, as I wanted to emulate the burned/scarred side of his face. It’s essential to spend quite a bit of time on the line work, as this will make the painting process that much easier. 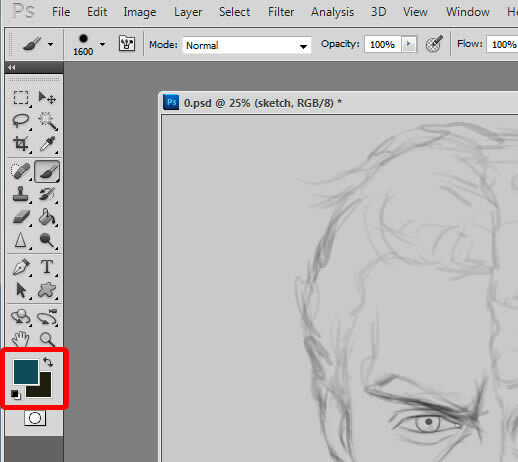 To draw in the sketch, I used a fairly small brush (around 8 pixels) with an opacity of 25%. I drew in the pose and marked down the features here, keeping avoiding superfluous details. When I was happy with it, I created a new layer set to ‘sketch’ and drew over the existing work; here is where I spent a lot of time with features, defining details and basically trying to keep everything as clean and crisp as possible. The work I put in at this stage will save me hassles during the painting process, since I’ll already have a good setup for the features planned out. With our sketch completed, we can now begin painting! The first step is to decide what the main color theme would be. In this case, I knew I wanted something very dark, as that would work well with the subject matter. 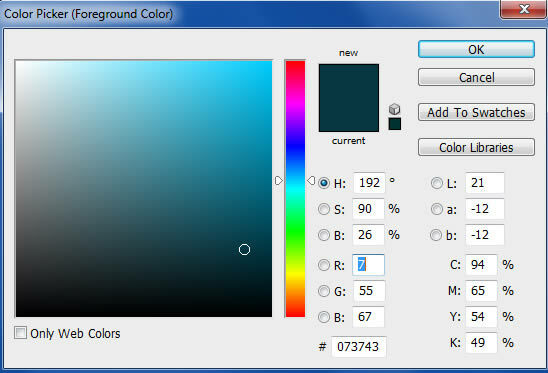 I decide to go with a fairly dark blue/green color for the background by double clicking the color box. I use the Gradient tool (G) to quickly fill in the background color. Now that I have the main color theme decided, I decide to quickly paint in the general lighting theme of the image. In this case, the lighting would be coming from the bottom to give it a dynamic look. I choose darker variations of the color I previously selected, and paint in those values at the top of the image. I paint in lighter tones as well, this time coming from the bottom of the image to represent the light source. I use the HSB sliders to do this quickly. To use the HSB sliders, make sure you have your color window open (Window > Color). If it’s not set to HSB, you can easily change it by clicking on the top right corner of the screen. It’s a good idea to select colors from both the color box and HSB sliders to get the best results. In general picking the colors with the color box helps get more precise colors and values, while HSB is a faster method suitable for background work. Once I’m happy with the look of the background, I create several layers to handle the figure. The 3 layers I create are titled ‘skin’, ‘black’, and ‘white’, the latter representing the colors of the clothing. I pick a desaturated red hue for the skin base and paint in within the line work. 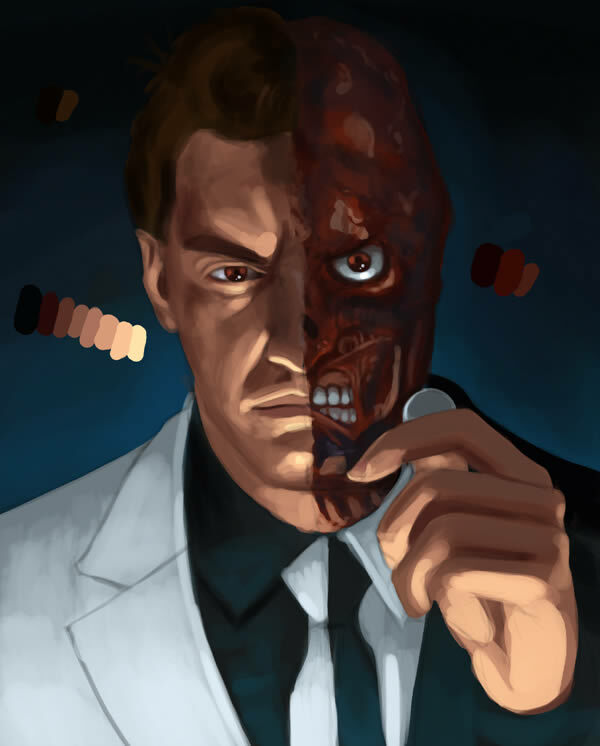 I also paint in a fairly dark, red-ish hue to represent the scarred side of his face. For the attire, I choose a fairly dark blue hue for the ‘black’ layer, and a fairly bright, desaturated blue for the ‘white’ layer, respectively. I make sure to paint within the line work as carefully as I can, and using the Eraser (E) tool to clean up any brushwork that goes over the line work I’ve established. Here is where we establish values. First I work in the darker values for the skin tone. 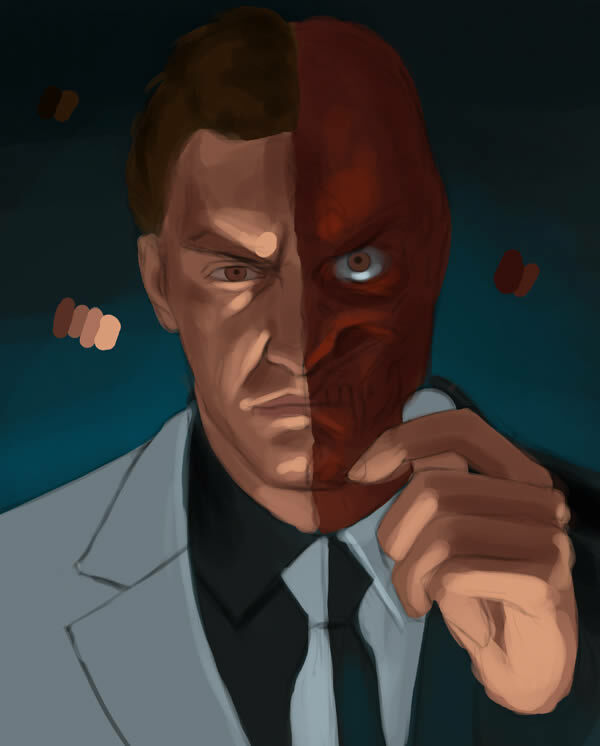 I select the existing color base for the skin using the Color Picker tool (Alt + I), and select a darker and more saturated hue. I add this to my palette at the left side of the skin, and begin block in in where the shadows would be using a reference as a guide with a medium sized hard-edged brush. I use the same technique for the rest of the elements (burned skin, clothing) as well. To ensure that my colors don’t pass through the color base already established, I make sure that each layer is ‘locked’ when painting in the darker values. 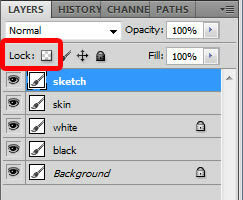 To do this, simply click on the first ‘Lock’ option on the Layers tab. With our darker tones established, it’s now time to bring in the lighter tones to the image, which will really help it come alive and give it a much more realistic feel. The technique is the same as before, only this time we use lighter and slightly desaturated versions of the base colors we’ve already established. I add the tones to my color palette as well to quickly pick and apply them throughout the painting process. Don’t be afraid to push your highlights, as this will give much more credibility to your image. As before, always keep the light source in mind so everything remains unified; In this case, the light is coming from the bottom so all the planes and forms should depict this to give the image credibility. Here I introduce even brighter values to give the image a stronger value statement. I also begin to do some detail work, such as defining the eyes as well as the burned side of his face. I work with a closer zoom at this stage, and smaller brushes as well for further definition. 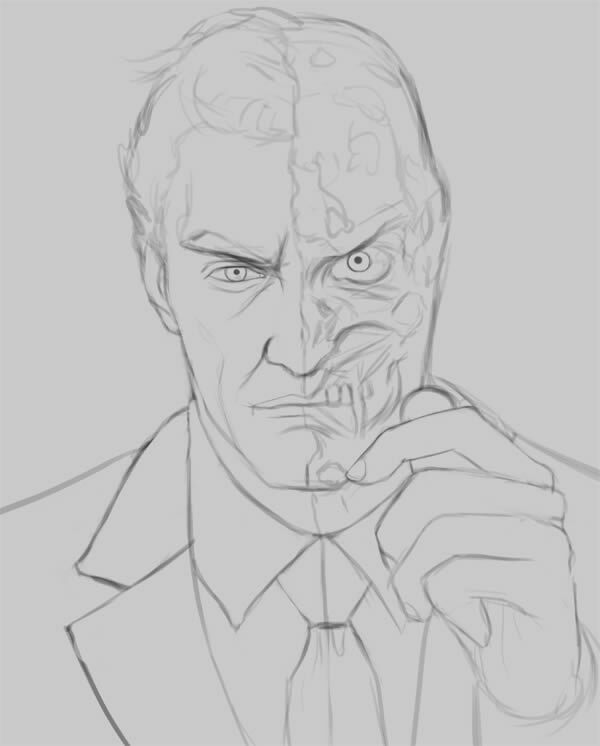 I make sure to apply the same amount of detail to all the elements (face, hair, hand, suit, etc.) to make sure everything is nice and unified. As always, everything is done using a hard-edged brush here. As a tip, avoiding overworking individual elements for too long is a good idea at this point. When I’m happy with the values set up, I decide to smoothen out the skin. 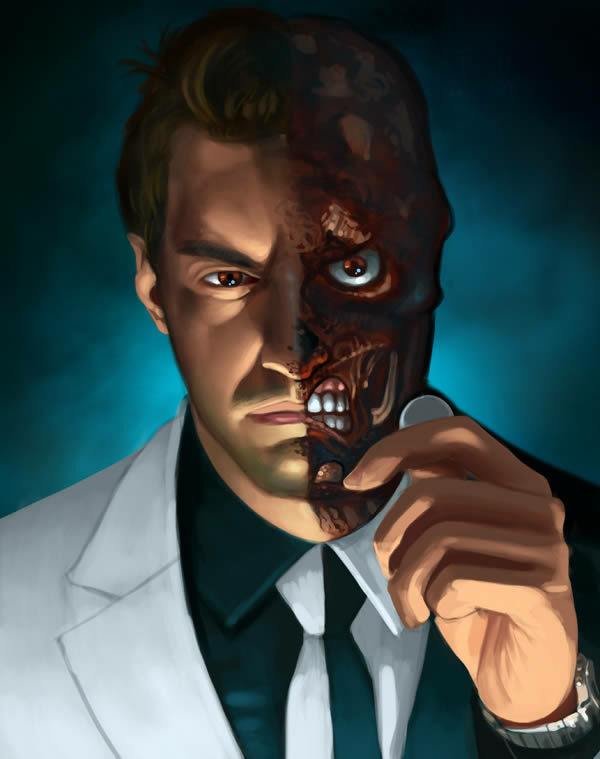 To do this, I create a new layer over the skin, and select an airbrush with 0% hardness, and opacity set to roughly 33%. I smoothen out the harsh transitions caused by the hard-edged brushes we’ve established, until everything appears much more smooth and natural. The same technique is also applied to other elements as well. I also use a speckled brush (a brush made up of a combination of small dots) to give the skin and suit more texture and life. 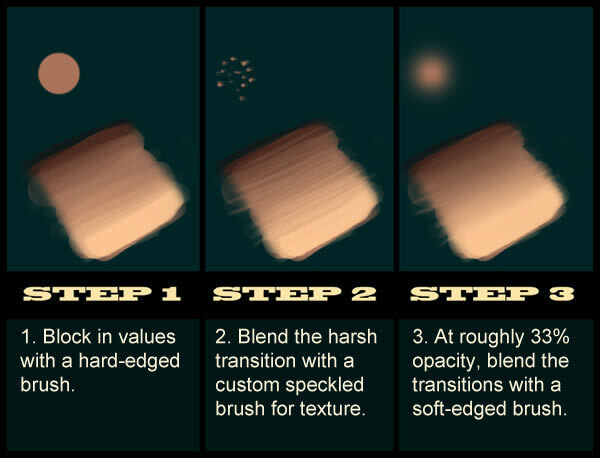 Be careful with soft edged brushes as well; Although they’re excellent for blending and smoothing, overuse of this brush can give you a lifeless, almost cold render since it lacks texture. At this stage I decide to rework the colors and background a bit. The contrast of the background was much too high previously, which took attention away from the figure. I choose a darker, less saturation variation and paint it on on a layer about the ‘background’ one. When I’m satisfied with the results, I use Photoshop’s Color Balance tool (Image > Adjustments > Color Balance) to alter the skin tone a bit to reflect the new background image, introducing some more green and cyan variations for the shadows, and a more yellowish tones for the highlights. 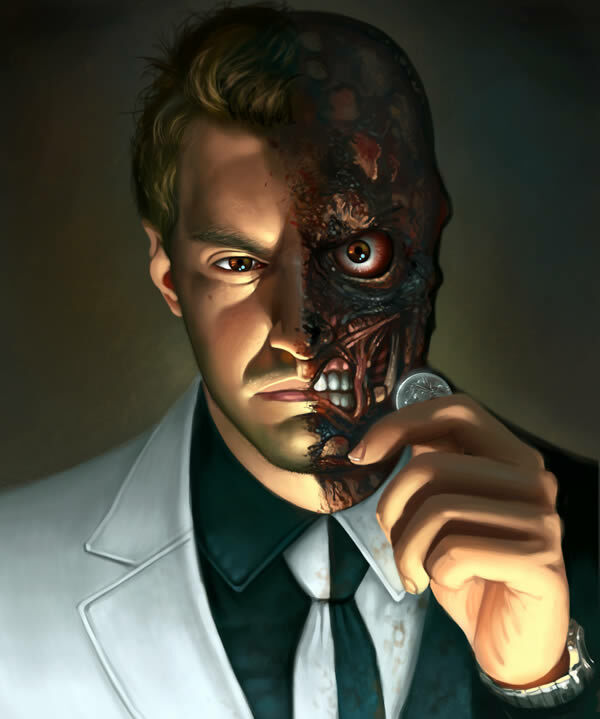 These tones not only helped the image unify more, but also caused the burned side of his face to gain more attention, which is a plus. 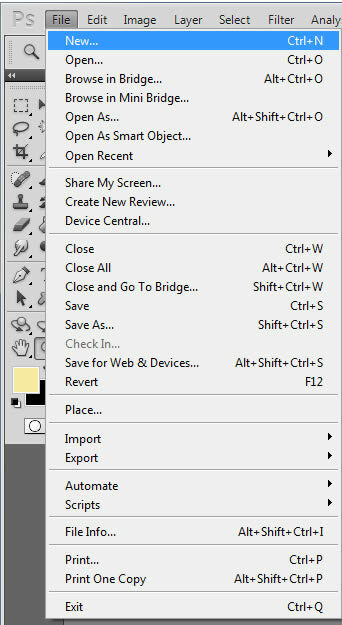 Don’t be afraid to do things like this in Photoshop – you can easily repaint elements and rethink color choices with Photoshop’s options, so take advantage of this! 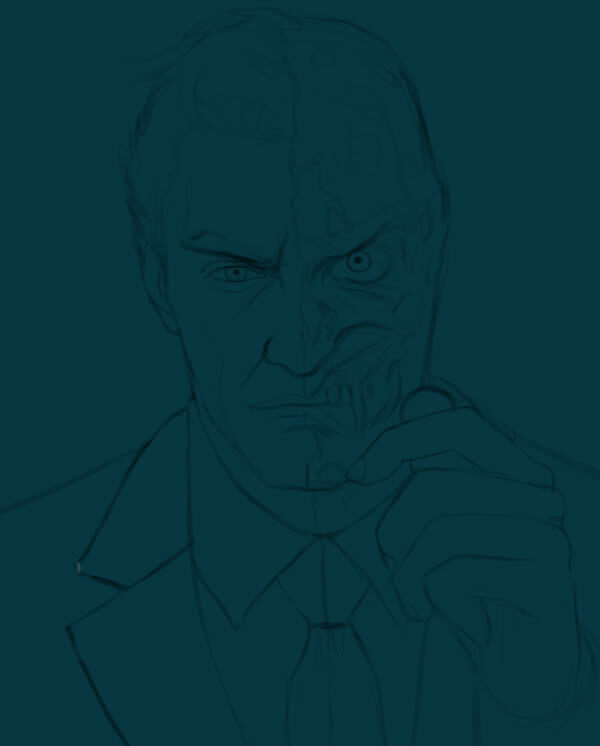 I decide to do some detail work on the scar, as it’s easily on the most important elements of this piece. I wanted the scar to appear believable as it did in the movie, so I quickly looked at some screen grabs from the filming and studies several shots of his appearance to emulate that look. I worked in at an extremely close zoom at this stage, detailing it with some very small variations of the soft edged brush. No fancy brushes we’re required at this stage, a lot of the detail work here is basically done using a stipple technique with the small brushes to give it an illusion of a very detailed look. As always, I keep in mind the forms of the face, and make sure to stick to the lighting that was already established in previous steps, so I’m very careful with my value choices here. I proceed to add more details on the scar as well as the coin, using the techniques described in the previous step. 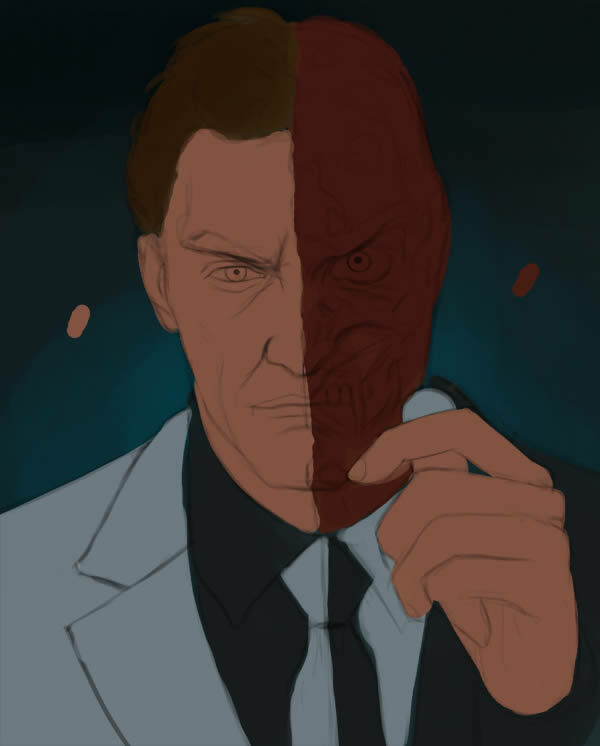 I also add more greenish hues on the right side of the background, which helps the burned side of his face pop out more. Additionally I decide to add some texture work on his suit, to help unify it a bit more. 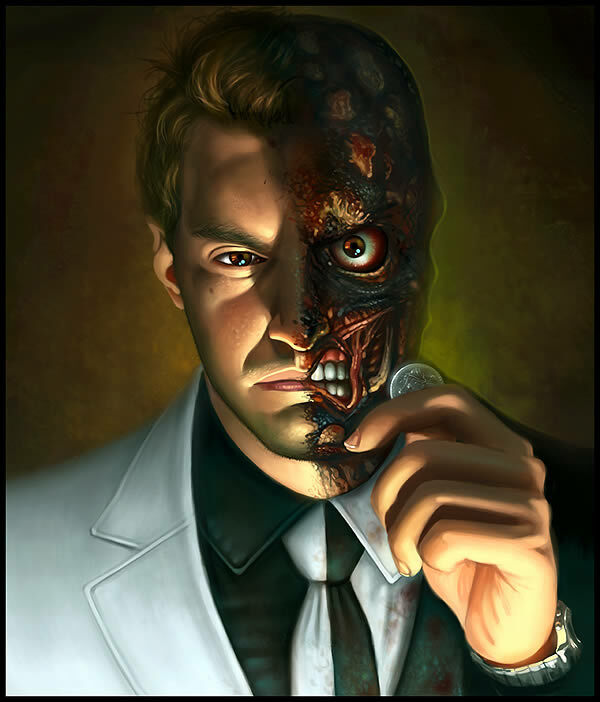 I wanted it to be dirtier to unify it with the scarred face. To do this, I create a new layer on top of the attire and set it to ‘multiply’. I pick a fairly dark, red-ish hue, and with a large, soft edged brush, quickly apply some ‘dots’ to the suit to give it some texture. To make the texture even more believable, I use a custom texture brush I painted previously and erase some of the ‘dots’, which gives the texture even more credibility. Custom textured brushes are very useful for this sort of thing, so make sure to experiment a lot in that regard. The image is pretty much complete at this point. It’s just a matter of doing some more detail work with the techniques already discussed, using a very large zoom to help bring out the details. 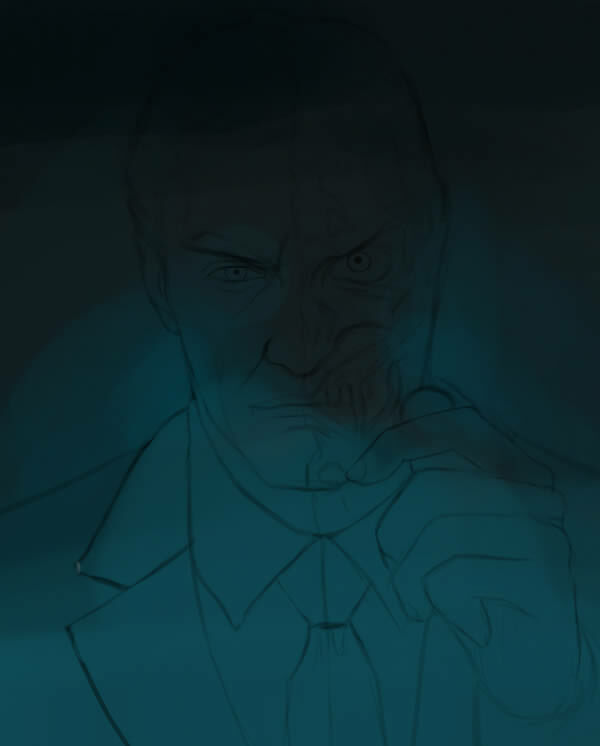 A minor addition was to add some slight rim lighting on the right sight of his face to help him pop out more, as well as to bring more attention to the scarred appearance. I bring in some lighter values to the background as well, to help give the painting even more life and contrast. I also enhance the colors a bit more using the Color Balance tool, adding more greenish hues for the Shadows, and more yellowish tones for the highlights. This helped to give the image more credibility and contrast overall. 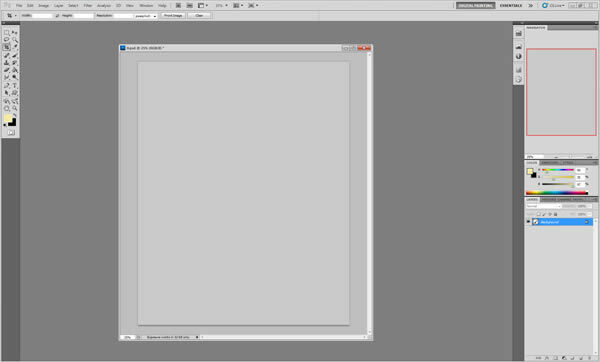 The final step is to use Photoshop’s excellent Levels tool to do some lighting enhancement (Image > Adjustments > Levels). And that’s it! I hope you enjoyed this tutorial, and happy painting!